Lulu’s Rescue, working on a foundation of proven models nationwide, has devised an exciting local initiative that will help save the lives of hundreds of thousands of homeless companion animals. Our mission at Lulu’s is spay/neuter, humane education, and rescue. One of the most exciting movements in spay/neuter right now is clinics offering low-cost, high-quality, high-volume spay/neuter surgeries. The biggest challenge for these clinics at start-up is acquiring facilities to perform the surgeries—but we have found a cost-effective way around this problem. Lulu’s is now working to bring this spay/neuter model to our communities by acquiring construction trailers (once used as offices on construction sites) and repurposing them into surgical pods in areas with extreme populations of companion animals. We know from our previous 1100+ spay/neuter surgeries for low-income families that there is a direct correlation between these surgeries being performed and the number of animals who land on death row in subsequent months. Without question, increasing the number of surgeries decreases the number of puppies being dumped in shelters. Our spay/neuter pods are an economical way to bring more surgeries to the areas that need them most. Each pod is divided into three sections: an Intake/Reception area, a Surgical Room, and a Recovery Room. 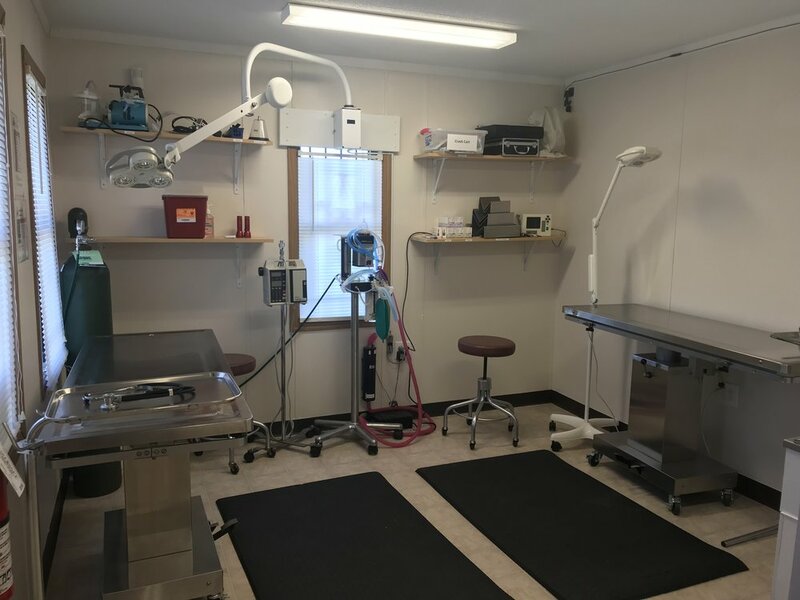 Materials will be primarily stainless steel and tile, to maintain as sterile of an environment as clients would find in any other veterinarian’s facility. After four years of beginning our Spay/Neuter Pod Initiative, converting office trailers to spay/neuter surgical units, we are beginning to see change take effect. This has been an exacting and incredible journey that required persistence, an unwavering commitment, and a can-do spirit of all involved. Lulu’s partnered with Ark of McCurtain County, Oklahoma; an underserved rural community with a 99% kill rate at their shelter. We transported our first POD, with spay/neuter surgical equipment, to Broken Bow, OK in November of 2015. Ark opened their doors in February of 2017 and have been providing free or low-cost spay/neuter surgeries and rabies shots to hundreds of families. Life-saving surgeries have been performed on 652 animals in eight months saving millions of animals from being born into the cycle of homelessness, suffering, and death. Chesapeake Feline Association, in Perryville, MD, was awarded our second POD and low cost spay/neuter services have begun for cats in August 2018. After their first year of operation, services will be extended to dogs. "We are officially open! This dream has finally become a reality. Who would have known that meeting Michele Armstrong at a Best Friends conference and discussing this idea would develop into a life saving partnership. This partnership is aligned both in vision and focus for the animals. Since our ribbon cutting on August 9th, 2018 we have performed 198 surgeries life-saving surgeries based on the High Volume/High Quality ASPCA Humane Alliance formula." Lulu’s is thrilled that our efforts are having a life-saving multiplier effect across the country. An intimate night of music with Grammy award winning entertainer Melissa Manchester to benefit Lulu's Rescue!! Don't miss this opportunity to see Melissa Manchester and help Lulu's save more dogs at the same time! Save the date for a special Tito’s Vodka event AND the kick-off of Lulu’s weekly Yappy Hour at the Red Owl in Center City Philly! Bring your furbabies for all their mani/pedi's! Heather of Beyond the Vet, a vet tech with over 12 years experience, will be offering pet nail trims FOR friendly dogs, cats, rabbits, ferrets, guinea pigs. The cost is $10, with proceeds going to Lulu's Rescue! Designate Lulu’s Rescue as your charity and participating stores will donate to Lulu’s with every purchase. Support Lulu's while you walk your Pup! Go to WoofTrax.com, download the app, and support Lulu's every time you walk your dog.